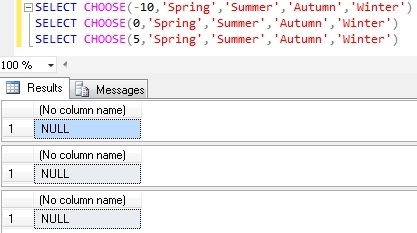 CHOOSE is one of the new built-in logical function introduced as a Part of Sql Server 2012. It returns the value at the specified index position from the list of values. Example 2: CHOOSE function with variables as index and values. Example 3: CHOOSE will return NULL if INDEX position is outside the range of values. Example 4: If index value is numeric, it will be implicitly converted to INT. 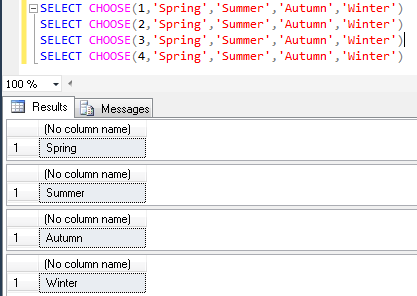 Conversion failed when converting the varchar value ‘TEST’ to data type int. Because 3.89 to 3 becomes what? why 3.89 turned to 3 ? Implicit conversion to int doesn’t round numeric values, it just takes the “characteristic” (number before the decimal point).